As of today, the village score system is working. During this trial period, scores may reset without much else going on. Eventually the village scores will allow Kage and council members to purchase provisions or benefits for their villages. It also serves as a reflection of how well each village is doing in the ninja world. There are 3 scores each village has - Intel, Economy and Manpower. Each affected by different kinds of missions. Intel is a reflection of how much information your village has on it's enemy villages. Economy is an indicator of how well the villagers and ninja are living in your village. 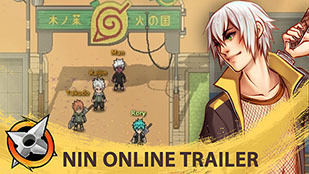 Manpower is how much your ninja are participating in helpful activities for the village. To check on your village score, talk to the Notice Board in your village. From there, select "Scores" to see the scores of your village and enemy villages. Note that non-ninja villages do not have scores. However, Missing ninja missions they do against other villages can also affect the scores of Ninja villages. The missions will display what scores it affects in the mission rewards. 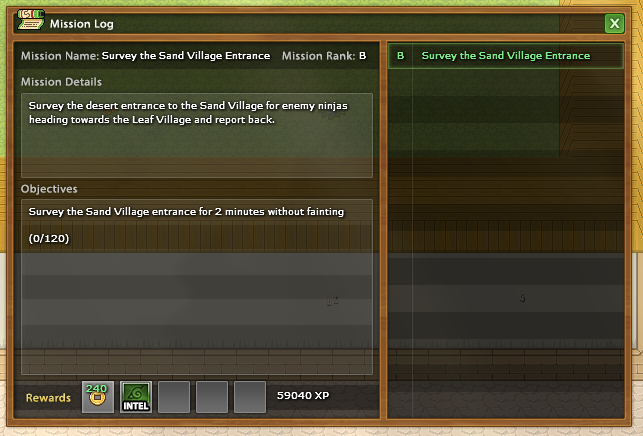 For example, surveying the Sand Village Entrance as a Leaf ninja impacts the Leaf Intel score positively as shown below. RP & PvP Tournaments can now start rewarding villages with scores depending on how well they perform. The frequency that scores will reset has yet to be decided and we are running these systems as an experiment to see if scores could potentially impact RP systems. For example, allowing players to impeach a government if Economy score is dwindling low. Expect to see use case scenarios for each score as time goes by. Including ninja tool supplies, buying uniform for promoted ninja and the such with economy score. Advantages in village vs. village events with Intel score and and increased security for villages with Manpower score. We're also going to balance the amount of score each mission gives/takes over the course of the next few months.